The Swallows are specialized arboreal insectivores " instantly recognizable by their slender, streamlined bodies." They are "familiar birds throughout the world, often nesting in close association with people, even inside their homes. They are known to many as harbingers of spring and as symbols of good luck. As a family they are easy to identify, but the family includes many closely related and similar species" (from Turner & Rose 1989). The swallow that "returns to San Juan Capistrano Mission" each March is the Cliff Swallow (left). I love watching them gather mud to build their globular homes in colonies under bridge or the eaves of buildings (or on cliff-faces out in the wilderness). They stuff as much mud as possible into their beaks and carry it substantial distances. Swallows on the wing are hard to photograph, so most pictures are of birds perched, like the lovely cosmopolitan Barn Swallow (below right). Swallows are indeed harbingers of spring and are among the first arriving migrants in California. This particular Barn Swallow, for example, documents the earliest ever arrival date in the Yosemite region (Gaines 1988, who says this 3/24/78 record at El Portal is the "extreme" date for the west slope). Gaines (1988) also informs us that Barn Swallows were not recorded in Yosemite Nat'l Park before 1949, "yet now they are plentiful in mid-elevation meadows, plastering mud nests onto ledges in houses and barns." There are things going on with swallows we don't understand. One thing often overlooked involves plumage changes from juvenal to adult plumage in some species, like Tree Swallow (below). 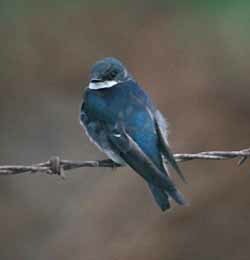 Juvenal Tree Swallows begin flying as brown birds, when they can be confused with the often-rarer Bank Swallow (see Wilds 1985, Lethaby 1996), but change to the glistening steel-blue color of adults over time. Males change rapidly, but females have a first-summer plumage (Hussel 1983) that is intermediate. This photo is likely one such female, still bearing a trace of the broad white tertial tips that characterizes young birds. In western North America, Bank Swallow (below left) has become a very scarce and local species, but it has a worldwide distribution and is known as the "Sand Martin" in the Old World. It is shown against the vertical sand-bank in which it builds its tunnel-like nests. Africa and Eurasia have a number of other small dull martins like the Pale Crag Martin (below right); their nests recall Barn Swallow. [Turner & Rose (1989) lump it with the Rock Martin H. fuligula of Africa]. All of the above swallows & martins are in the subfamily Hirundininae, the familiar swallows of the world. More intriguing are the two species of river-martins in the subfamily Pseudochelidoninae. These are aberrant hirundines with a larger stout bill, more robust legs & feet, and triangular-shaped wings. 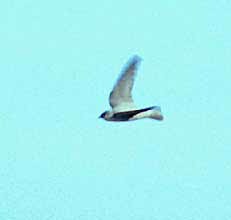 In flight, the African River-Martin (right) reminded me of the woodswallows [Artamidae] of SE Asia & Australasia. Until recently, the African River-Martin was a bird of mystery. It appeared and disappeared along large rivers in the Congo Basin. Today we know it nests on the coast in southern Gabon (as well as a local site in West Africa) and migrates deep into the interior. One is quite lucky to come across a small migrant flock in the interior (as was this bird; one can barely see the red bill in the original photo -- that may be lost on this screen). The White-eyed River-Martin Pseudochelidon sirintarae of southeast Asia is even more elusive. 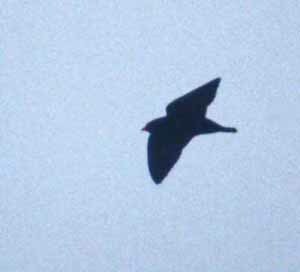 Its breeding grounds are unknown (Turner & Rose 1989) but one wintering roost was in central Thailand. The population sizes of both river-martins must be rather small. 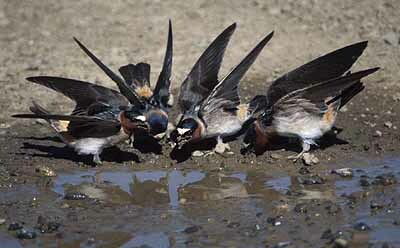 Photos: The Cliff Swallows Hirundo pyrrhonota were gathering mud at Anderson Marsh State Park, Lake Co., California, on 5 Apr 1996. 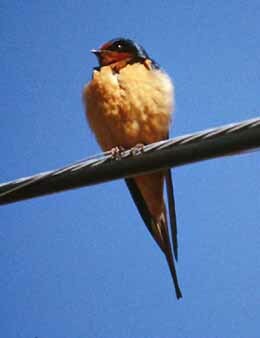 The Barn Swallow H. rustica was at El Portal, just ouside Yosemite Nat'l Park, on 24 Mar 1978. The Tree Swallow Tachycineta bicolor was at Salinas wastewater ponds, Monterey Co., in Aug 1990. The Bank SwallowRiparia riparia was at a colony near King City, Monterey Co., in May 1986; this colony has since been abandoned but a new one has been established several miles distant. The Pale Crag MartinH. obsoleta was over the Sharm-el-sheik sewage ponds, Sinai (then occupied by Israel, now Egypt) in Nov 1981. The African River-MartinPseudochelidon eurystomina was soaring over the Lolo River in central Gabon on 9 July 1996. All photos are © D. Roberson. Turner, Angela, and Chris Rose. 1989. Swallows & Martins: An Identification Guide and Handbook. Houghton Mifflin, Boston. In the standard format of whole series of books, many by Pica Press (although this is not), color plates are found separately (with facing page captions) from the text, giving the feeling this is meant to be a field guide. The quality of the paintings is reasonably good, although there is the barest minimum of background (an occasional branch or nest). The introductory text is good, and the species accounts seemed well-researched for biological issues. But I was disappointed upon first purchase to find a lack of detail at the "tough" i.d. level (e.g., southwestern Cliff Swallows versus Cave Swallows), some missing distributional records, and the British provincial approach. Books that claim to have a worldwide perspective should not have the English bird called "House Martin" (unmodified) while others are termed "Asian House Martin" and "Nepal House Martin" (particularly when elegant solutions -- Asian Martin & Nepal Martin (Clements 1991) or Common House-Martin, Asian House-Martin, Nepal House-Martin (AOU 1998)-- exist. Turner & Rose actually apologized for using Barn Swallow over "the Swallow"!! 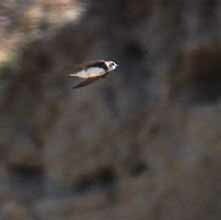 And various "rough-winged" and "cliff" swallows abound unnecessarily. The text may be a fine introduction to worldwide biology in swallows (it did win "Best Book of the Year" in British Birds) but its coverage of distribution or i.d. may not be entirely up-to-date. When I used it in Africa, I found numerous small distributional errors in the Congo basin region (several species occur in Gabon, for example, that are not mapped there). I suspect the i.d. text is equally insufficient on more obscure species. Perhaps must annoying, however, is the authors' outdated taxonomic perspective. They are "lumpers" and list only 75 species. [Clements (1991) has 98 plus AOU (1998) splits at least two more [Peruvian Martin Progne murphyi & Galapagos Martin P. modesta from Southern Martin P. elegans]. So while overall it is about what we can be expect these day -- an attractive book on the shelf or to flip through with dreams of world birding -- it is less than satisfactory in other respects, resulting in this mixed review. American Ornithologists' Union. 1998. Check-list of North American Birds. 7th ed. A.O.U., Washington, D. C.
Gaines, D. A. 1988. Birds of Yosemite and the East Slope. Artemisia Press, Lee Vining, CA. Hussel, D. J. T. 1983. Age and plumage color in female Tree Swallows. Journal of Field Ornith. 54: 312-318. Lethaby, N. 1996. Identification of Tree, Northern Rough-winged, and Bank swallows. Birding 28: 111-116. Wilds, C. 1985. Unraveling the mysteries of brown swallows. Birding 17: 209-211.